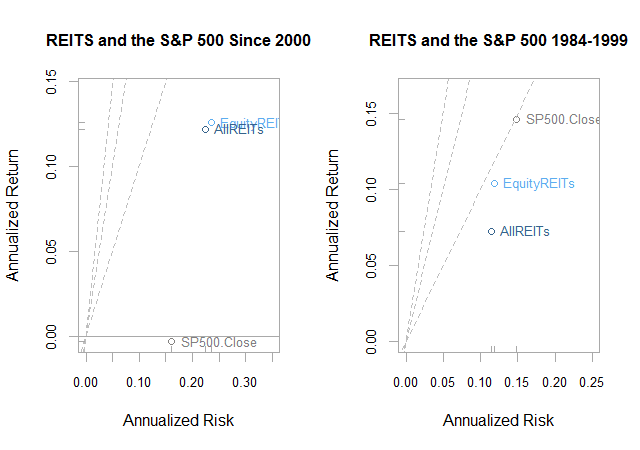 Timely Portfolio: Obviousness of REITs? and clearly the finance community appreciates these with the first as a First place winner of the 2012 NAAIM Wagner Awards for Advancements in Active Investment Management and the second with a download rank of 2 on SSRN with 273,000 abstract views. However, I struggle mightily with how obvious would these papers’ choice of assets been without the benefit of hindsight. I already briefly touched on this flaw in Bonds Much Sharpe -r Than Buffett. Of course, using what we now know is one of the best asset classes in the history of the world that has also experienced an anomalous and extremely negative correlation with equities during their distress will provide a very positive result. Unfortunately, I have yet to find any research from the late 1970s or early 1980s that predicted such a glorious environment for bonds. Similar but not quite as extreme, adding REITs (all my posts about REITs) over the last 12 years in any way would almost guarantee a pleasant result. 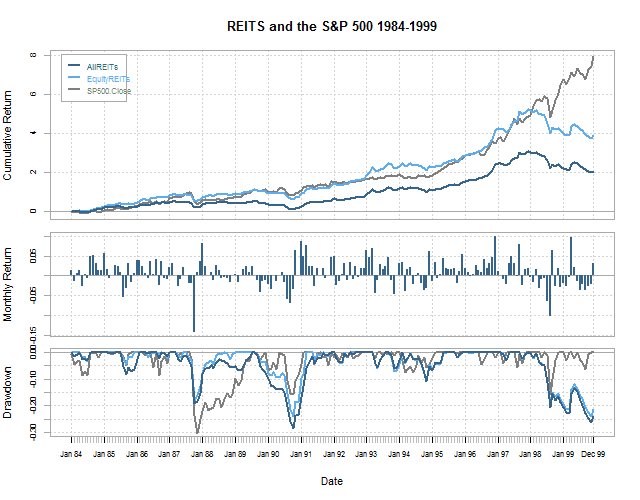 However, REITs were not so stellar for the 15 year period 1984-1999. Would REITs have been such an obvious choice in 1999? Of course, if we know the future, but I’m not so sure when we only knew the past. Also, how obvious would gold have been in 1998 or how obvious would high yield have been in the early 1980s when they did not even exist? Can we expect the next 10 years to look like the last 10 years? You raise some interesting points. But I think you are assuming that assets are chosen mostly based on past performance. Bonds and stocks have always been regarded as good diversifiers based on their different risk profiles and lack of high correlation. You could say the same about international diversification. In selecting high yield, you could be looking to diversify fixed income along the natural duration and quality axes. 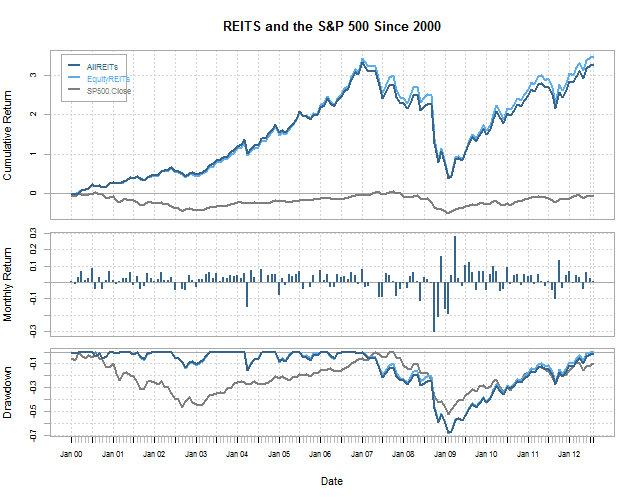 REITs might be chosen as a diversification between real estate and equities. In fact, you might look to diversify ex-ante wherever you have a bonafide risk premium along with modest or low correlation. Commodities, gold, currencies could be problematic in the risk premium area, but I don't use any of these in my momentum indices. Thanks so much for your comment. I very much like your paper and agree that the methods offer a much better approach than buy-hold especially in this environment. I most want to temper expectations for bonds and reits, but especially bonds. I would really enjoy discussion of replacements for these ex-ante. Bonds have always been a pretty decent diversifier for equities. The question for me is how best to use them. I agree completely that there can be unrealistic expectations about future performance of bonds based on the performance of the past 20 years. This is especially problematic when one takes a risk parity approach toward asset allocation, which some seem to be doing now, both with momentum and elsewhere. In the face of complete uncertainty, one might equal weight a portfolio. Correlations, in a broad, general sense, might be included without much bias, in my opinion.